“We should explore the large cave,” he told his people. “How many brave hunters will offer to go on this venture? Of course, it may be very dangerous, but we have brave hunters.” No one responded to the Chief’s request. 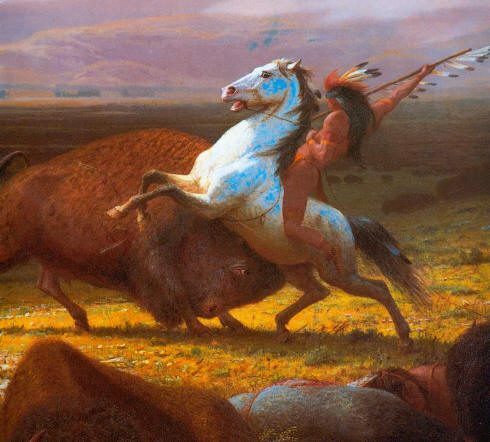 Finally, one young brave painted himself for hunting and stepped forth, replying to the Chief, “I will go and sacrifice myself for our people.” He arrived at the cave, and to his surprise, First Brave found two other Cheyenne hunters near the opening, where the stream rushed underground. “No, you are mistaken about us. We really do want to enter the cave with you,” they said. “What do you want, my brave ones?” asked an old Indian grandmother as she opened her door. “Are you hungry now?” she asked. “Oh, yes, kind Grandmother, we are very hungry,” all three braves answered. “Look out there!” she pointed for them to look through her window. The old grandmother brought each of them a stone pan full of buffalo meat. How good it tasted, as they ate and ate until they were filled. To their surprise, more buffalo meat remained in their stone pans! “Thank you, thank you, thank you, kind Grandmother,” said the three young Cheyenne braves. When the young hunters returned to their tribe with the gifts of buffalo meat, their people rejoiced over the new, good food. Their entire tribe ate heartily from the old grandmother’s three magic pans, and were grateful.